MarCO (Mars Cube One) is a two spacecraft mission to accompany the InSight Mars lander to provide real-time data relay during the landing phase, as the MRO, MAVEN, and Mars Odyssey orbiters will not be in position to receive InSight data. The probes are nick-named Wall-E and Eva. The MarCO space craft were built at the NASA Jet Propulsion Laboratory to the 6U-cubesats form factor. 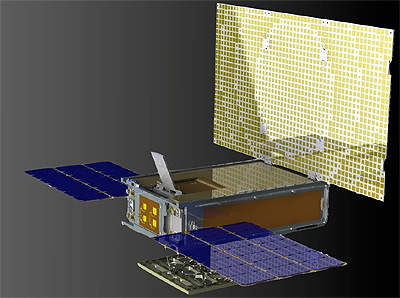 They feature two deployable solar arrays and a deployable X-band antenna and an UHF antenna. These provide an 8 kbps UHF link from InSight to MarCO and an 8 kbps X-band link: MarCO to the Deep Space Network (DSN). A color wide-field engineering camera on each MarCO will be used to confirm high-gain antenna deployment. The wide-field camera has a 138-degree diagonal field of view. Each MarCO also carries a color narrow-field camera with a 6.8-degree diagonal field of view pointed in the direction of the UHF antenna (the opposite direction from the high-gain antenna). Both cameras can produce images 752 by 480 pixels in resolution. Both MarCOs carry a self-contained propulsion system featuring a system-in-a-tank design with propellant storage and feed system, thrusters and a controller and sensor suite. It has four 4 axial and four RCS 25 mN thrusters using R236FA hydrofluorocarbon gas as propellant. The MarCO satellites were deployed from the Atlas-5(401) launch vehicles upper stage and fly on their own to Mars, performing trajectory correction maneuvers. Depending on remaining fuel, the MarCO crafts may continue on to visit a small body.